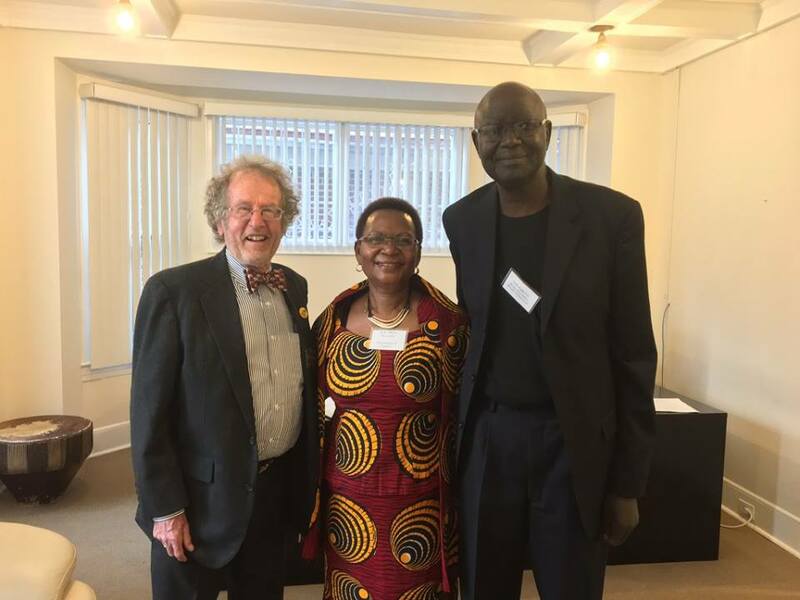 Seth Eggessa (right), Ugandan-American Rotarian in the Twin Cities poses with Ambassador Oliver Wonekha (middle) of Uganda and Books for Africa founder Tom Warth at the Uganda embassy in Washington, DC on April 2016 when the ambassador hosted a reception in honor of Books for Africa supporters. Mr. Eggessa died on Friday, January 6, 2017. Photo: Courtesy of Books for Africa. Seth Eggessa, whose wide smile and infectious laugh was a fixture at Twin Cities community and charitable events and who was very articulate in explaining the challenges Africa faced to prospective donors and supporters, died on Friday, January 6. He was 67. His death was confirmed by Paul Musherure, a Twin Cities dentist and fellow Ugandan. The cause was abdominal cancer. 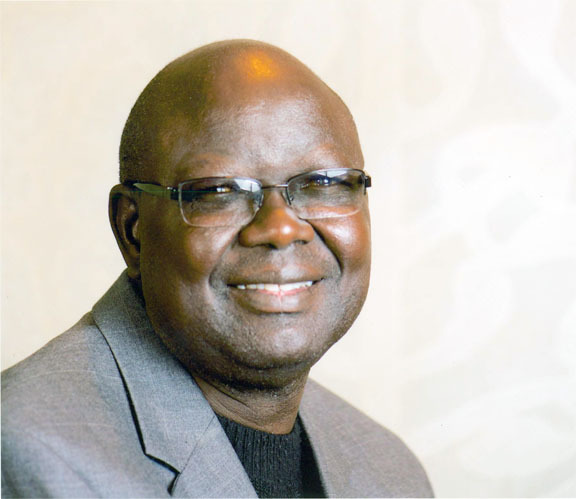 After a brief banking career in Uganda, he arrived in Minnesota in 1977 to attend the University of Minnesota Duluth where he graduated with a BA in Business Administration. After graduation, he pursued a career in the financial services industry where he found success. The financial services sector with its emphasis on having one’s affairs in order before you die certainly had an impact on the late Eggessa. For many years he worked for Ameriprise Financial, the successor to American Express Financial Advisors which was a subsidiary of American Express Company. He would exhort fellow community members to set up retirement plans for themselves and college funds for their children. “We have not had to do any fundraising within the community to give him a proper send-off,” his friend of 17 years Dr.Musherure told Mshale. Musherure said the late Eggessa had set up his affairs in order with proper instructions on how to access his funds and accounts to ensure a proper burial. “He certainly lived what he preached.” He never wished to be a burden to anyone especially after death. Despite his many years in America he never forgot the people he left behind in his native Uganda. He would lead what he used to call book missions there as he sought to improve literacy among the youth. He was a longtime board member at Books for Africa, the largest shipper of donated school textbooks to the African continent. He would make numerous such trips to Uganda to supervise the delivery and distribution of books. By the time of his passing he was instrumental in the shipping of well over 70,000 textbooks to the Tororo region of Uganda where he hailed from and to the capital city Kampala through a project with the United States Peace Corps. He was an active Rotarian and a member of the Roseville Rotary Club, according to Bradley Kirscher, president of the Roseville Rotary Club. “When I joined the club back in 2010, he was the membership director,” Kirscher said underscoring the importance Eggessa attached to the sustenance of the club by recruiting new members. During his time as the membership director, he became very active in Rotaract, the Rotary-sponsored service club for young professionals and an important pipeline for future Rotarians. Together with the club, they built a multi-use building in Tororo that housed both a clinic and library. 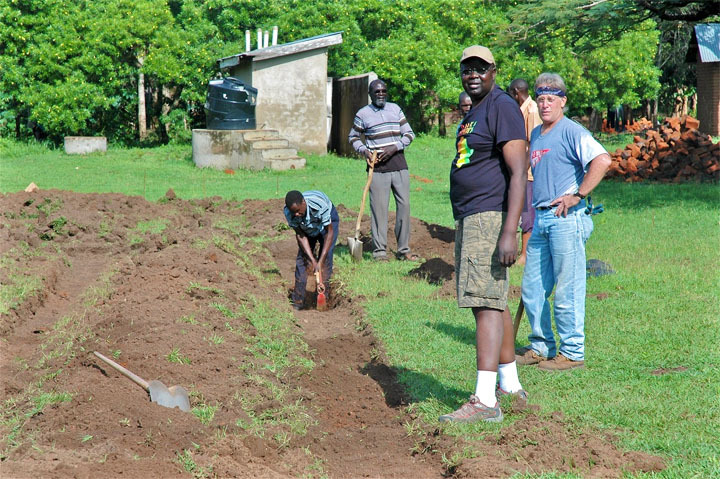 Another Rotarian, Dave Schafer of the Rotary Club of Woodbury worked closely with Eggessa when his Woodbury Rotary Club joined forces with the Roseville Rotarians to sponsor the Tororo project through the Rotary Global Grant. With electricity a challenge in most of Africa, Seth was innovative with a plan to install solar lighting. “Seth was good about asking for contributions,” said Schafer. The beneficiaries of that energy after the kidney transplant were the children of Uganda through his involvement with Books for Africa and the Rotary Club of Roseville. Tom Warth, founder of Books for Africa described him as an indefatigable worker for his community and that “nothing slowed him.” Mr. Warth got the inspiration to start Books for Africa in 1988 during a visit to Uganda. He had one estranged son from a previous marriage. He would dot over the many nephews and nieces he had, proudly sharing their accomplishments with friends like a proud father would. He is survived by his four sisters Lydia A. Jones, Faith J. Tumwebaze and her husband James, Judith N. Ojambo, Mary Rager and her husband Jimmy. Seth is also survived by his brother Clement O. Ojambo and Clement’s wife Margaret as well as many nieces and nephews. Patrick Plonski, the current executive director at Books for Africa described him as a valued and dedicated member of the Books for Africa family that everyone liked. “His dedication to education in Africa and especially his home country of Uganda was inspirational to us all. He will be sorely missed,” Plonski said. Books for Africa, where the late Eggessa was a board member for five years, has established the Seth Eggessa Memorial Libraries project in honor of his service to the organization and children of Uganda. You can read more about it in the organization’s Uganda project page here. Details for a memorial service are below. Note: The author served with the late Seth Eggessa on the board of Books for Africa and parts of this obituary are based on details shared between the two. Editor’s note: An earlier version of this story stated Mr. Eggessa’s age as 67. Mshale has since learnt that he was 65. The story has also been corrected to state that indeed the deceased had a son and was not childless as previously stated in the story.